This entry was posted in Recovery & Support and tagged Addiction, Professional Help, Support, Trust on July 19, 2016 by Baxter Ekern. Recently popularized by television shows like “Intervention,” staging a meeting with family, friends and addiction specialists for a loved one struggling with drug addiction seems like a good idea in theory. The purpose of an intervention is to help convince the addicted individual to attend treatment and commit to overcoming his or her addiction. The intervention process usually involves planning between the addiction specialist (usually an addictions counselor, social worker or psychologist) and loved ones of the addicted individual in advance. Family members and friends will be asked by the specialist to write a letter to their loved one explaining how the addiction has affected their relationship, and why they would like to see the person attend treatment. Ideally, your loved one will accept the offer for treatment, own how much their addiction has affected their life and the relationships between everyone involved, and commit to getting better. This would be the perfect outcome of the intervention. In reality, the meeting might not turn out as everyone would hope, even though you really are trying to help. Your loved one may accept the offer of treatment and acknowledge the problem, but then back out before starting or fail to comply with the rules of the treatment program. The old adage, “You can lead a horse to water, but you can’t make him drink,” is quite fitting for this situation. While your best intentions are to help your loved one receive the care and help they need, if they aren’t ready to commit to treatment, then it’s unfair to push it on them. The individual may comply initially to please friends and family, but at the end of the day, it is the addict himself or herself who must want treatment more than anyone else. In the worst-case scenario, your loved one may become upset and angry over the staged intervention, leading to tears, frustration, and resentment among everyone involved. Your loved one may lash out and become angry at this attempt to “force” them into recovery, although that is far from what you may have had in mind. Your loved one may run away or cease contact with you in retaliation to the intervention attempt, which puts them at risk for continued drug use. Everyone else involved may become angry and upset with the addicted individual for refusing to take the offered help. It is not because the addict is being selfish or doesn’t want the help. It is likely that they are not ready and feel overwhelmed by the situation. A trained intervention specialist will be knowledgeable in responding to the various outcomes, and should provide guidance on what to do next should your loved one respond negatively. From a clinical perspective, intervention means “treatment” – whether this is in the form of medication, therapy or mindfulness-based treatments. Anything with an intention to modify the behavior in question can be considered an intervention. As opposed to approaching your loved one as a group to propose treatment, you may be more successful if you gently approach the subject of treatment on a one-on-one basis. You can even use the same strategy as what would happen in a TV-style intervention, without the multi-person ambush. Better yet, let your loved one bring it up to you first, and then explain how much you would like to see them get help. Should You Wait For Them To Bring It Up? Waiting for your loved one to approach you for help with treatment shows not only that they are considering or ready for treatment, but also that they trust you enough to bring up such a touchy subject. Telling another person about their struggle and asking for help can make the addict feel vulnerable, and it is certainly not an easy discussion to have with just anyone. Be a trustworthy confidante for your loved one by keeping your conversations confidential. Offer to help them find suitable treatment, whether it means counseling, medication or inpatient (residential) treatment. You can find many support groups online that may offer advice on how to support your loved one during or prior to their treatment period. Does One Intervention Fit All? To answer the question, “How do you know if an intervention is right,” the solution is never black and white, and you may never know if a drug addiction intervention will be right. Every person will respond differently, and what might work for you may not work for your loved one. As much as you want to see your loved one get help to overcome their addiction, the best way to support them is to respect where they are in their journey and wait until they are ready. What you might see as “hitting rock bottom” may not be the same for your loved one. Even if your loved one wants to get help, they may not be ready for the intensive work and commitment required during treatment. Let your loved one know that you love them and care about their success in overcoming their addiction, and encourage them to seek treatment when they are ready. Whether the intervention comes in the form of counseling, medication or a full-on intervention-style approach, your loved one is really the only one who can gauge which treatment approach will be best for them. 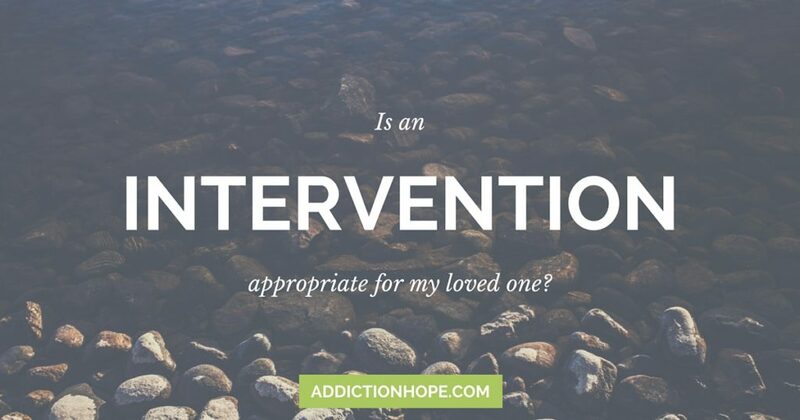 What has been your experience with interventions for a loved one struggling with drug abuse? Did you enlist a trained interventionist to assist with the conversation? What type of approach was utilized? Please share your experience in the comment section belwo. Stephanie Sands is currently pursuing a Bachelor of Science degree in Kinesiology and majoring in Mind Sciences. She completed an Honors Degree in Psychology in 2012, focusing on eating disorders and personality. 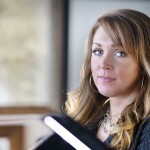 She intends to combine her educational background into a holistic wellness practice. The opinions and views of our guest contributors are shared to provide a broad perspective of addictions. These are not necessarily the views of Addiction Hope, but an effort to offer a wider discussion on various issues.